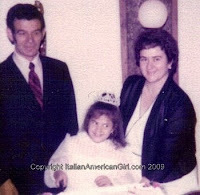 Italian American Girl: Growing Up Italian American & Celebrating My First Holy Communion. Growing Up Italian American & Celebrating My First Holy Communion. This past weekend, I celebrated my niece's first holy communion. Ok, but the picture on the left is actually me (being a joker) and my parents. Experiencing all these milestone occasions with my nieces and nephews now always put me through these reminiscing journeys, where I think back on how it was for my immigrant parents to adjust to the Americanized ways of celebrating occasions and answering to Americanized kids who demanded the American way. So, I thought back to my communion and how my parents made it the best ever that I could imagine. 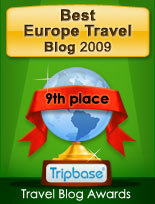 I have amazing memories of that day and the unbelievable party they threw me in one of the best restaurants. Mind you my parents worked hard and were by no means wealthy, so throwing a party and not skimping on anything meant a lot then and now. I appreciate my parents for everything they did to make that day special for me. One other example I can recall too was so many of my American friends were getting Communion portraits done and I remember not asking my mother to do one because even as a kid I knew that would cost a lot of money. But, a few days before my Communion, my mother surprised me and told me I was going to get in my Communion dress and go to a professional photographer to get my portrait done. I was so excited!!!! That's a nice vintage photo. There's definitely history in the Italian American families. 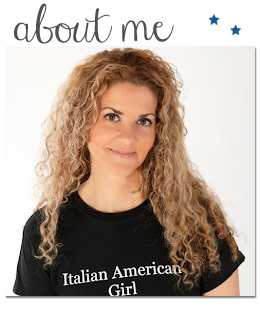 Thanks so much, I have such amazing pictures that I will post along with each growing up Italian American story.